ATV Parts, ATV Radiator Kits, ATV Wheels Tires, ATV Suspension Springs Shocks Bumpers - Wild Boar ATV Parts > Big Wheel Kits > EFX MotoHavok 35X8.5X20 Big Wheel Kit $1437.00 FREE SHIPPING! « EFX MotoHavok 42X8.5X24 Big Wheel Kit $2290.00 FREE SHIPPING! Get your NEW Moto Havok BIG WHEEL KIT TODAY! Don’t miss out, they won’t last long! NOW $1437.00 includes FREE SHIPPING! (select models of wheels may include additional charges)! Control Arms, Axles, Lift Kits, Portals, Performance Parts, LEDs, ACCESSORIES, Snorkel Kits, WINCHES, Wild Boar Bumpers, Wild Boar Radiator Relocation Kits! Call us today at 850-912-4350 or Order Online! Here at Wild Boar we are PROUD to offer the NEW EFX MotoHavok tires in one of our famous Big Wheel Kits. 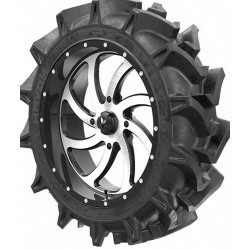 These new mud tires were designed with ATV/UTV mud enthusiasts in mind, made to out-perform any other tire on the market. EFX combined unparallelled deep mud traction with a smooth hard-packed ride quality to ensure you have the best ride possible not matter what terrain you’re on. The MotoHavok is the first in the industry to have a check mark tread pattern. This design gives your ample traction both in drive and reverse. These tires were created to be the ULTIMATE mud tire. The best part? The EFX MotoHavok is the only ag-style mud tire to feature an ultra deep wheel lip protection, armoring your custom wheels from sticks and rocks when you’re hitting the trails. Now you can feel safer taking your brand new wheels out on the trails for the first time. This tire and wheel kit will come with (4) EFX MotoHavok Tires mounted on (4) Wheels of your choice and will include your lug nuts.